A robotic approach to mass-producing organoids could accelerate regenerative medicine research and drug discovery. Bird's eye view of a microwell plate containing kidney organoids, generated by liquid handling robots from human stem cells. Yellow boxed region is shown at higher magnification. Red, green, and yellow colors mark distinct segments of the kidney. "This is a new 'secret weapon' in our fight against disease,' said Freedman, who is a scientist at the UW Institute for Stem Cell and Regenerative Medicine, as well as at the Kidney Research Institute, a collaboration between the Northwest Kidney Centers and UW Medicine. In this process, the liquid-handling robots introduced the stem cells into plates that contained as many as 384 miniature wells each, and then coaxed them to turn into kidney organoids over 21 days. 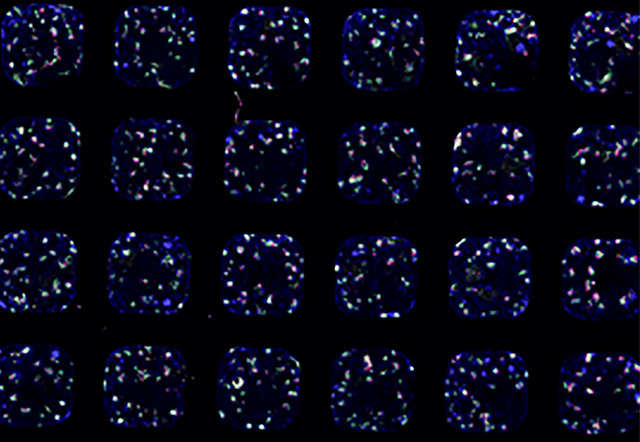 Each little microwell typically contained ten or more organoids, and each plate contained thousands of organoids. With a speed that would have impressed Henry Ford's car assembly line, the robots could produce many plates in a fraction of the time. "Ordinarily, just setting up an experiment of this magnitude would take a researcher all day, while the robot can do it in 20 minutes," said Freedman. "On top of that, the robot doesn't get tired and make mistakes," he added. "There's no question. For repetitive, tedious tasks like this, robots do a better job than humans." "We established that these organoids do resemble developing kidneys, but also that they contain non-kidney cells that had not previously been characterized in these cultures," said Harder. "These findings give us a better idea of the nature of these organoids and provide a baseline from which we can make improvements," Freedman said. "The value of this high-throughput platform is that we can now alter our procedure at any point, in many different ways, and quickly see which of these changes produces a better result." "This was unexpected, since myosin was not known to be involved in PKD," Freedman said. Myosin, which is better known for its role in muscle contraction, may allow kidney tubules to expand and contract. If it is not functioning properly it might lead to cysts, Freedman explained. "It's definitely a pathway we will be looking at," he said. The title of the research paper in Cell Stem Cell is, "High-throughput screening enhances kidney organoid differentiation from human pluripotent stem cells and enables automated multidimensional phenotyping." This news release was written by Michael McCarthy.